At least 33 Palestinian protesters were shot and injured by Israeli soldiers Friday, at the Great March of Return in the Gaza Strip, medical sources said. Protesters were shot at with live ammunition and rubber-coated steel bullets as they approached the barbed-wire perimeter fence. Of the 33 shot, one protester was critically injured, while many others suffered the suffocating effects of tear gas, the Ministry of Health in Gaza has confirmed. 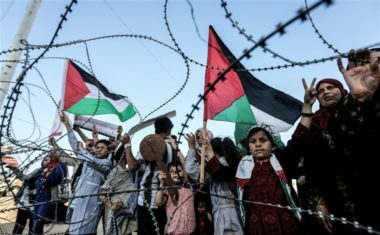 The Gaza Strip has been under an Israeli and Egyptian blockade since 2007, the protesters are calling for ending the siege. The Great March of Return began March 30, 2018 and has continued every Friday since. The stated aim of the protest is for the right of the Palestinians to return to their homelands, they were forced out of in 1947. Nearly 2 million Palestinian refugees live in the besieged Gaza Strip, along the coast of the Mediterranean Sea.